Have you ever visited your local hardware store and purchase some bagged rhizomes? Did you bring them home all excited to see if they would look as good as the picture only to have them never sprout at all? That has happened to me more times than I can count. But I finally got lucky with my red ginger. Shopping at Lowe's for some annuals late last spring I nosed around in the stacked boxes of bulbs and found a bag labeled Red Ginger. I thought for two bucks I'd give it a try. Surprise of surprises it not only sprouted, it grew to about 4 feet tall and now has a red cone. Of course I have to have a name for my prize so I turned to my Stokes Tropicals Plant Guide knowing I would find it there. Sure enough it is a Zingiber Zerumbet Shampoo Ginger aka Pine Cone ginger. The plant grows about 6 feet tall in partial shade and produces green cones mid-summer. Little yellow flowers appear under the bracts of the cone before it then turns bright red. It prefers a semi moist soil and should spread and produce more plants next year. For those who live in a more seasonal climate, you can grow this plant well in a container. Here's some fun facts. 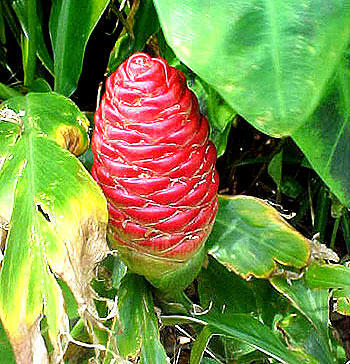 According to our friends at Floridata, this plant is called shampoo ginger because of the milk-like substance in the cone used in shampoo in Asia and Hawaii. It also soothe toothaches and stomach discomforts. Beautiful and useful to boot. Of course the leaves get a little beat up in the wind, but who cares? What a bargain! Happy Gardening.